Rwandan journalists have formed an investment company – which they believe will bring to an end what has become a traditional bad perception about media practitioners in Rwanda. For some time now, the public has in one way or another branded members of the media as financially challenged fellers, lunch and transport beggars and many other demeaning names. The new company – Media Ventures Group Limited (MVG Ltd)- launched on Sunday March 26, at Rwanda Press House in the capital Kigali, seeks to end this perception, its members say. “It has become a daily talk that Rwandan journalists do not have a vision…we are regarded as unprofessional, poor, desperate beggars of free services like lunch, transport and other things. This is the right time we join hands and build a sustainable future and change this mindset,” said Didas Niyifasha, the Company President and Legal Representative. According to Niyifasha, Rwandan journalists are tired of being undermined in nature, and the new media company is a solution to self-sustaining. 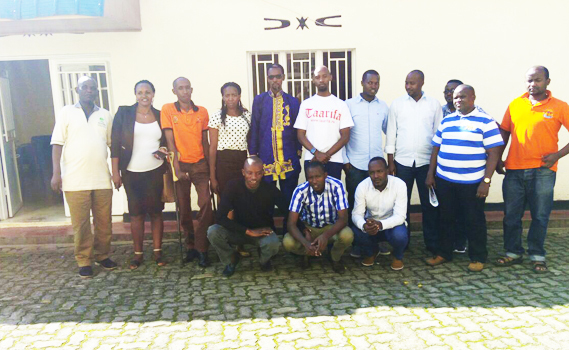 While Rwandans in different sectors have teamed up to work together, journalists remain scattered, with existing media bodies not equipped enough to fund journalists’ projects nether pay them enough nor sustain themselves [media houses]. Through the new established company, shareholders say, journalists will get a chance to work with financial institutions and execute bankable projects. “First on our agenda is to ensure we build affordable houses for journalists. Most media practitioners have no contracts and so they cannot get and finance a mortgage. We need to work on these challenges,” Niyifasha said. With now 30 members, and initial capital share of Rwf60m, under its structure, shareholders will contribute Rwf10, 000 every month, into the fund to mobilise more capital for bigger and sustainable ventures. However, all the members will contribute skills, other resources to deliver on projects and also mobilise funds from other sources to invest. More members will be allowed to join the company as secondary shareholders, but with equal say and benefits except status and some privileges. Niyifasha said that shareholders had first decided to contribute Rwf30,000 monthly but they realised many journalists could not afford that sum and decided to reduce it to Rwf10,000 which he thinks is affordable to every journalist. He said they reimbursed the money and began afresh. Elections were conducted on Sunday, establishing the organisation structure and the leadership of the venture. Magnus Mazimpaka, the CEO of Ingam Group Ltd, the mother company of Taarifa Ltd, was elected as an Advisor of the Board of Directors and the Chairman of the Investments Commission. He said the Media Venture Group has a plan to invest in different fields including hospitality, housing, transport and media, among others. “We have been waiting for this moment. It was like a light bob moment, we were awakened by the challenges we face in the industry, but we are guided and encouraged by the opportunities amidst us and the abilities we have that had never been utilised,” Mazimpaka said. The leadership of the company has a mandate of three years renewable. The company, Mazimpaka said, is open to work with partners as it seeks to improve the welfare of all Rwandan journalists. “What we want first is to put our strength together whether journalists with or without contracts so that in the future we would have journalists who will have been helped by our company,” Niyifasha said. Meanwhile, Gasabo District has offered the company a piece of land from where a suitable developer will be awarded a contract to construct houses for journalists. Some financiers have been contacted and discussions already began. According to Mazimpaka, `like it has been in other industries, MVG Ltd has been set up to put [Rwandan journalists’] `efforts together to mobilise whatever small resources they have so that they are able to generate and invest it in particular projects that will help them increase their income and create wealth, adding that `members of the group share the same vision’’.